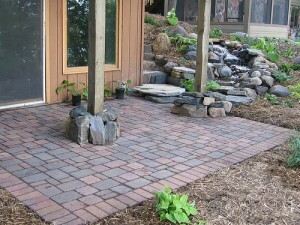 An example of a paver patio. Paver patios are a great addition to any home. If you want a space in your backyard to hold a party, have a barbecue, or just enjoy your yard, a patio is the way to go. And as we’ll see, pavers are one of the best materials you can use to create these projects. Patio pavers go well in nearly any backyard with any decor. The design options are near limitless, and they require little maintenance. Best of all, the patio paver usually requires a simple installation, especially if there are no curves or cutting of the paving stones required (such as if the patio will be a perfect rectangle without any restrictive borders like your home, a walkway, a pool, etc.). Thus, it is well within the range of the typical DIY homeowner. 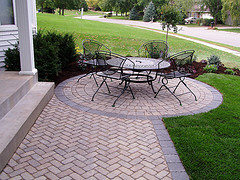 Overall, the look, feel, and comfort of any backyard can be improved with the addition of patio pavers. As we can see in this picture, adding a table and chairs to your patio can make it a great place to relax and enjoy the great outdoors. 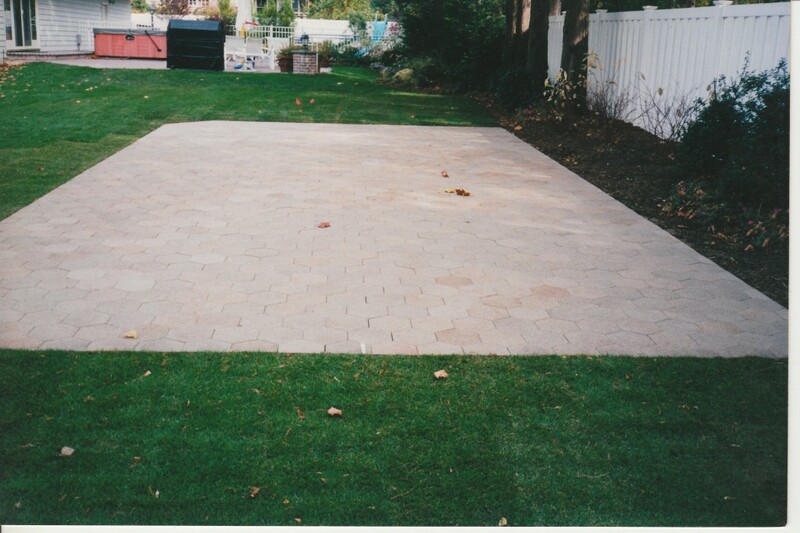 There are three general types of paver that can be used for a backyard patio: concrete, stone, or clay pavers. While this page will focus on the concrete variety, stone and clay (or brick) pavers are also a viable option. The major differences between these pavers and the concrete type are primarily in their looks and price. Stone pavers, for instance, look more ‘natural’ than concrete paving stones. However, this beauty costs. Otherwise, brick, stone, and concrete are largely the same in the following parameters. There are many reasons to select concrete paving stones as the material that will make up your patio. The major reason is strength – they are both durable and flexible. The compact base underneath, as long as it is installed correctly, gives the concrete pavers patio stability while preventing major settling due to the bending and buckling when water freezes and thaws. This flexibility and durability is also increased by the joints between the pavers. For these reasons, pavers resist cracking and splitting which may befall other materials options. While the installation of a patio paver is usually more expensive than other options, like poured or stamped concrete or asphalt, the results are much more pleasing to the eye and easier to maintain in the long run. Using concrete pavers for patio construction is an especially good option if the patio is near a pool or if you live in an rainy environment, as the surface of the pavers are simultaneously smooth, ensuring a great look, while also being slip-resistant. Even if someone’s feet are wet and the pavers are wet, they will not slip as the surface gives enough friction to prevent this. Furthermore, as discussed above, unlike asphalt and concrete the patio will not develop any cracks which someone could fall over. Thus patio patio paving stones are a great option if you like to entertain or if you have active children. Maintenance and repair of these brick is also relatively simple. If you need to replace a paver that has been chipped or stained, simply pop it out and replace it with a new one. Maintenance is limited to periodic cleanings of the surface, refilling the joints with sand or joint material, and sealing the surface to protect it from water, fading, and stains. What about other materials choices? Sure, you could throw down some easy and quick concrete. However, this material won’t look nearly as good as pavers, even if you get the stamped or colored variety, and it won’t last as long – it will crack eventually. Even if budget is a consideration, you may still be able to find a paver project that’s right for you and your home. Another example of a patio made with pavers. Note the waterfall in the background and the 'square' shape of the project. One of the other benefits of paving stones is the sheer number of options you have for design. As seen in the two photos on this site, you can create many different projects depending on the shape, dimensions, pattern, and color selections you make. Here are some general design tips for a concrete paver patio. When it comes to design, the first major choice you need to made is on the brick level – what kind of paver to use. There are different styles, textures, surfaces, shapes, sizes, and colors of pavers. The paver you select will have a profound impact on the design options available to you. Take, for instance, the shape of the pavers. You can buy paving stones in a variety of shapes, from the standard rectangles and squares to the more daring circles, octagons, zigzags, hexagons, and even irregular shapes. Obviously, the shape you pick will both determine and limit the patterns you can lay the brick in. When choosing patio paver colors, make sure to see what would look the best given the color scheme of your house and backyard and any other distinguishing features of it. When deciding upon paver patterns for the patio (like herringbone or running bond) consider what might look the best given whatever structures are surrounding your project. Certain patterns will look different and give a different appearance, so be sure you know what a pattern will look like, and how it will interact with other features of your landscape and hardscape. You may consider working with a professional designer to maximize the beauty of your project, or you could try it yourself, especially if the project is simple. For other pattern and design ideas, check out other parts of this site. Depending on the size of your proposed patio, completion of the project could take anywhere from two days to a week or more. Budget in some extra time just in case the installation hits any snags or takes longer than expected. For more installation tips, see the “Installation” section of this site. A very important consideration when planning out your paver designs is to consider the grade, or the slope, around your proposed area. You or your contractor will need to ensure that any water that may fall on the patio, like during heavy rains, will not simply lay there or, worse, flow back to your house, flooding your basement or doing other structural damage. Also, if you are planning on installing your patio in a new area, make sure there are no important utility lines or cesspools that may disrupt the patio. Think of the behavior of your backyard – certain areas may be more weak than others, which could cause settling. Though concrete paving stones are strong individually and as an interlocking unit, without a firm foundation they can settle (though it is not in principle difficult to fix if they do). One thing to keep in mind when planning a paver patio: whoever is installing your project, either you or a contractor, will need to get materials into the backyard. If you have a fence that blocks entry, you may have to take it down temporarily to admit machines and materials, if necessary. It is possible to dump the materials in your front yard and wheelbarrow them back by hand. This option however could add expense and time in order to properly complete the project. Work with your contractor to figure out what can be done to expedite the process. Paver patio cost will depend on how much preparation needs to be done in the area. If there is an already existing installation, or if a lot of excavation and removal of material is required, prices will be higher than if the area is already prepped, or if the pavers will be installed over an existing concrete slab. Geographical location. Your pavers will be more expensive if you live in an area with a higher standard of living. Labor costs. The price of a paver patio will be lower if you do more of the installation and hard labor yourself. The more you give to contractors, the more you’ll have to pay. The specific designs. A complex design will require more time and effort (especially in the form of cuts to the bricks) than a simple design, potentially adding to the expense. The brand of pavers you select. Some are better quality than others and thus require a bit more money to purchase. However, you may want to invest in the higher quality paver so you won’t have to replace the installation as quickly as if you went with a cheaper, but less durable and beautiful, option. Though the paver patio cost estimate seems rather high, it’s actually a great balance between strength, beauty, and value. You know you’ll have the patio for a long time, and it will also add to the value of your home, representing a strong investment in your home’s beauty and in your own financial life. This entry was posted in Project Ideas and tagged advice, basics, installation, patios, projects by Will Grander. Bookmark the permalink.